The smart music bulb built-in bluetooth 3.0 speaker, can be paired with your smart phone or tablet. Sync light to your favorite music and enjoy every beat to the fullest. • Led light bulb with built-in speaker, brings you fantastic light and audio music enjoyment at the same time. • Bluetooth speaker with LED lamp appearance, can be connected to your smart phones or tablet for playing music. 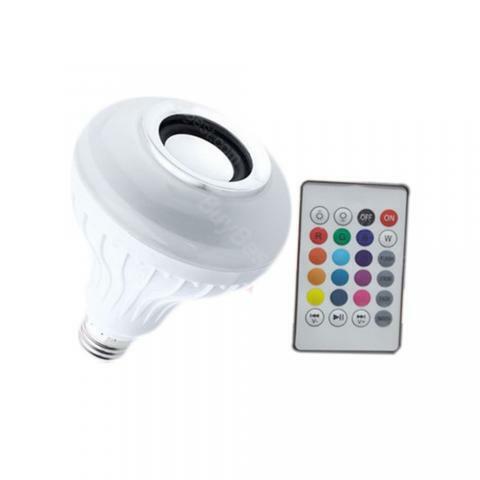 • Adjustable light color and music with a handy 24 key remote controller. • Bright light, comparable to a 50 Watts halogen bulb. It can be mounted to any lamp with E27 base. You can use it as a normal LED bulb or change colors for the kids as a night light. • Easy-to-Install and compatible with most mobile devices via Bluetooth, universal for IOS and Android. • Bright or dim, pure white or other 12 colors, changeable via IR remote control, use it as a party light to enjoy the music and add colors to your family life. • Amazing music & light perfect for BBQ and house parties, also suitable for the bathroom, bedroom, closet, cabinet, corridor, workshop, basement, garage, stairwell, oil depots, roof, door and other places. • This smart bulb can only be paired with a single phone and each phone can only be paired with a single bulb. Multiple bulbs require multiple bluetooth connections/devices to be configurable. 색상도 디자인도 괜찮고 불량품이 아니라서 다행이에요, 감사합니다. 밝고 음질도 좋고 모든게 다 굿이에요 굿굿굿~! 주변 지인들한테 추천하고 시퍼용~ 제품 너무 맘에 들어요.